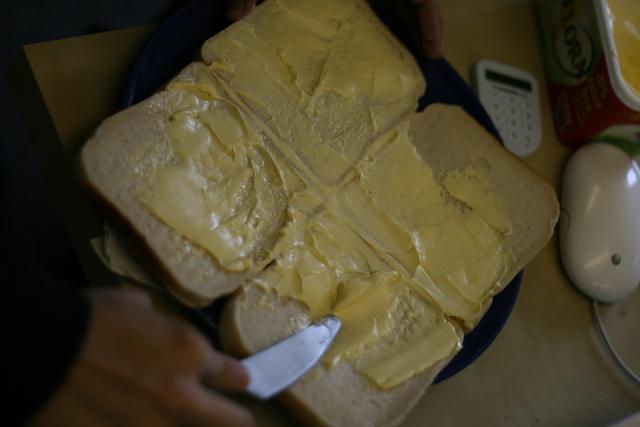 Measure the speed of light with margarine. We got ourselves some cheap sliced bread and a tub of margarine and prepared to measure the speed of light, getting a little over excited at the transformation of our office into a science lab, we almost forgot to follow the instructions. 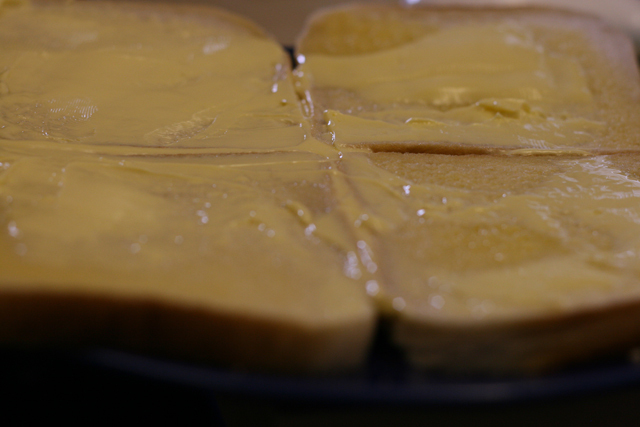 A thick layer of margarine is one of the most important first steps. 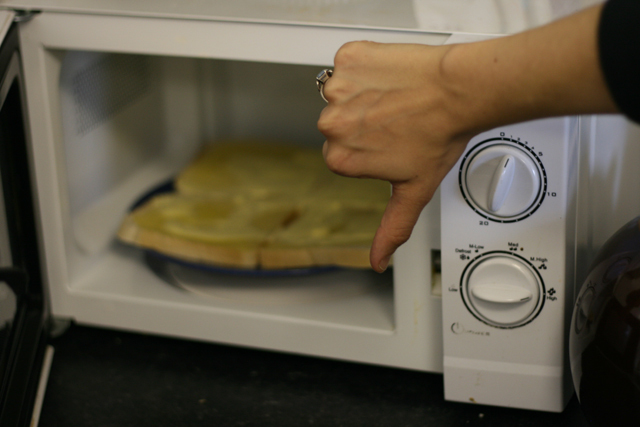 You pop the plate in the microwave making sure the turntable has been removed. Cook on full power for 15-20 seconds. This is when we thought it hadn’t worked. Actually it had - we just needed to measure the distance in centimetres between the melted patches and multiply by two. Then it was time for some serious maths. Buy a copy of the book to see exactly how it’s done. We will tell you that it works a treat. Crisp Packet Fireworks is available from New Holland Publishers, price £9.99. Enter the discount code Sch of Everything at the checkout for 20% off. Get your grubby little bits on a copy. Cool indeed. As we decide what next for School of Everything we’ve been doing a little bit of soul searching and thinking about what we truly believe in (as well as working hard, being nice to people and the power of good chili sauce). Here’s what we’ve come up with - would be great to know what you think. Everyone has something to teach. Everyone, yes everyone, has something they can teach someone else. Everyone has their own way of learning. It’s better to learn in the way you want to. You know what suits you best. Learning is better with friends. People are brilliant, inspiring, generous and smart. Being with others makes it easier and enjoyable to learn more. You should never stop learning. You can keep learning whatever your age, far beyond your school days. Education shouldn’t be expensive. With a bit of ingenuity you can learn new things without spending lots of money. All subjects are important. Learning is learning, and learning is good. Knowing how to rewire a plug is just as valuable as understanding inverse trigonometric functions. Qualifications are overrated. A good education is about the things you learn along the way, not a fancy bit of paper. The real world is better than the internet. Step away from your computer please. Getting out and trying new things is better than being sat at a desk all day. For one night only School of Everything will be hosting a live learning event at Brixton Village Indoor Market. It is all very exciting. Think of it as a speed dating night but for learning instead of dating. Come along to learn some stuff from School of Everything teachers and Brixton Village market traders. See how much you can learn in three hours, make your brain bigger, and enjoy some yummy food at one of Brixton Village's many top notch restaurants all with a bring your own booze policy. And if you've got a skill you'd like to share and teach on the night please contact us ASAP. Anything from Biology to Beekeeping, History to Hula hooping, Making friends to Martial arts. We shall see y'all there. P.S. You'll also get some free School of Everything goodies if you show your face. People Making Waves is an exciting project from Volunteer Development Scotland which aims to compile a ‘digital storybook’ featuring the stories and experiences of the country’s volunteers. These stories will form a unique and lasting legacy of volunteering - and they want as many people as possible to be part of it. Stories can be of any length and can be told in a variety of imaginative ways - using words, images, movies or even podcasts. For it to be a success they need as many volunteers as possible to take part and share their stories. So if you're a volunteer or have been in the past, share your story with them and be part of the lasting legacy of volunteering. Now please. 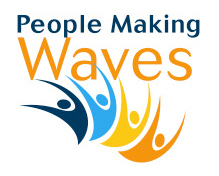 People Making Waves is part of The Scottish Project, which will create a cultural legacy from the 2012 Olympic Games. It is supported by Legacy Trust UK and by the National Lottery through the Scottish Arts Council. Just so you know. Visit their website to share your stories. In the early days of School of Everything we decided to write down our values when it came to education. We never really put them in the foreground on the site but as a team we're having a bit of a think about this kind of thing and we thought it might be worth revisiting them. Do they still hold up? Have we stuck to them? Are there ones that have developed as we've gone along. Would be really great to get your views. Here's what we said two years ago. Learning is personal: People tend to learn best when they can choose what, when and how they learn - and when they can find the right people to learn with. Learning starts with what you're interested in: It doesn't matter how long you're shut in a classroom, you won't learn anything unless you want to. But start with what you're interested in and it's surprising how fast you pick things up. We like face-to-face: The internet's a marvellous thing, but spending your whole life glued to a screen does strange things to the brain. So our focus is on helping people find real-time, offline, face-to-face learning. We're open-minded: We don't mind whether you use the School of Everything to organise a public course or a private lesson, a book group or a game of Hide and Seek. And whether or not you charge money, that's cool with us. Everyone has something to teach, and everyone has something to learn: This is the most important bit. Expertise, experience and excellence are to be admired, but there's knowledge and wisdom all over the place. We want to help everyone unlock it." Other than in the very early days of School of Everything we've always worked in Bethnal Green in east London. That's mainly Geoff Mulgan's fault because he offered us some free office space in the Young Foundation building. It's a wonderful place, full of interesting projects and organisations and surrounded by a few cafes which we used to frequent on a regular basis. As the credit crunch hit and we started to get a little bit bored of local eateries, I happened to get invited over to ThinkPublic for lunch. 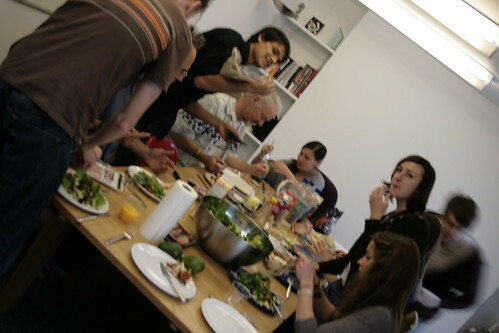 I though it was lovely that they all ate lunch together in the office and decided we should try it at Everything HQ. So we had a go the next week. We all put in a tenner and I popped along to the supermarket to stock us up for the week. The problem was we managed to eat pretty much a whole week's budget in one day. Not great. It took Pete to bring a bit of financial discipline to the situation and realise that we needed to do it each day. So now we all put in £3 if we're 'in for lunch' and a different person each day pops to the shops, somebody lays the table and somebody else does the washing up. And we've been doing it now for 18 months. It's mainly a cheap way to have a very healthy lunch but there have been lots of extra benefits. We have incredibly few internal meetings because we can just chat over things at lunch and it also gives us the chance to meet people we'd like to work with in a friendly way rather than in a formal meeting. So if you've got basic facilities (you really just need a sink to do the washing up and somewhere to eat), why not give lunch club a go where you work? And if you do, take a photo and pop it up on Flickr with the tag 'lunchclub' and tell us how you get on. We have a little problem with the School of Everything colour orange. Don't get us wrong, we love it - it's invigorating, it increases oxygen supply to the brain and stimulates mental activity - that's why we chose it for our website. But we're finding it very hard to find its match in the real world - we know there are different print processes and they results in different colours; we don't know why we can't get them to match up however hard we try - some are so way off they're in the red. We need your help! If our web colour is #FF6633 then what are our numbers for CMYK, RGB and Pantone? If there are any teachers out there that can give School of Everything a lesson in colour theory, printing and colour conversion please, please, please come and visit us and show us the way - we'll treat you to lunch! 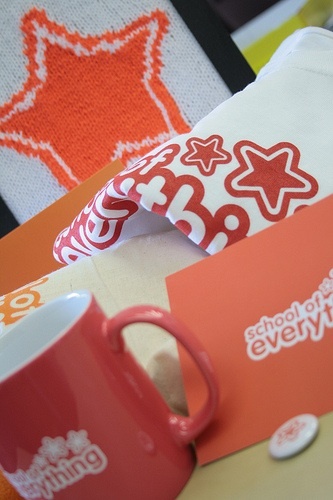 Here is some School of Everything swag old and new so you can see what we're talking about. We're very happy that the MLA has got very excited about the School of Everything, and is bringing all their libraries (that’s the ‘L’ bit in the name) on board as School of Everything venues. Over 3000 of their members signed the Learning Revolution pledge, which gives you some idea of the level of support out there – a lot. Libraries love learning – it’s what they’re all about. The books, DVDs, free internet access and stuff are just more ways of getting us to grow our brains and widen our horizons. In terms of the space they can offer: it really varies. There are libraries with rooms big enough to hold a large performing arts group, or a small elephant-swinging workshop (provided you clear up afterwards). There are libraries with fully equipped study rooms just crying out to be used (thanks to initiatives like The Challenge Fund). There are village libraries so small the staff have to synchronise movements just to get behind the counter, but even these have enough space and more than enough enthusiasm to accommodate learners and teachers. As you look round the site, you’ll see individual libraries beginning to add stuff to their venue entries so you can see exactly what’s on offer near you. And you don’t just get the space. With library staff on hand to help research whatever you’re into, or track down and order up learning resources, you’ll find plenty of useful backup. Many libraries already host things like reading groups (all of whom we hope will come along and join the School of Everything too). So they bring experience and advice to the party, as well as bricks, mortar and comfy chairs. We're big fans of Amnesty so when our friends down the road at Amnesty UK told us all about their new scheme to get people volunteering to raise a bit of money for human rights, we gladly offered to give them a bit of a plug. "Everyone needs a little help now and again, whether it is with plumbing in a washing machine, babysitting or learning a new language. Many of us have skills and time to offer. So, do us a favour. Sign up to Amnesty Hours. Once registered you can pledge up to 24 hours of your time over the course of a year to raise money through helping people out. We provide the information sheets and simple paperwork to ask your friends to make a donation instead of paying you. All funds collected will help support Amnesty's human rights work. You won't just be helping us, and people whose human rights are at risk, but also your friend." Why not volunteer to teach people a thing or two as part of your hours? We’ve been adding lots of new fangled features to the website, you’re helping us test them out, and everything’s moving along brilliantly. Meanwhile, our new friends Becta and BIS have been out and about supporting us and spreading the word. One of the best things about having new friends is that you get to meet friends of theirs, and all sorts of useful things can start happening. We were really pleased when Becta invited us on a date with their friends Harrow Council - just in time for Valentine’s Day. We really clicked - it turns out we have a lot in common. We both like choice, whether it’s learning Tabla one-on-one, or getting together to work on cake decorating or improving language skills. Harrow is bringing over 1,000 different learning opportunities, and all the venues, teachers and resources that come with them, to the School of Everything. We’ve already started loading all this lovely new stuff onto the website. Harrow very kindly say they’ve been ‘slightly blown away’ (only slightly?) by just how quick and hassle-free this has turned out to be.